This entry was posted in Campus Announcement, General News and tagged plant trees, survive, toomer's oaks on January 26, 2012 by Wire Eagle. AUBURN – The tradition of rolling Auburn’s oaks will continue even if the trees do not survive being poisoned in 2010. President Jay Gogue this week accepted the recommendation of the Committee to Study the Future of Rolling Toomer’s Corner, which proposed replacing the troubled oaks—should they die—with one or more large trees and using a temporary structure to celebrate victories until the new trees have established roots. Auburn horticulture and forestry experts will evaluate the current oaks this spring. They are not expected to survive. Development of a timetable to replace them is under way. This entry was posted in General News and tagged capitol, toomer's oaks on May 16, 2011 by Wire Eagle. 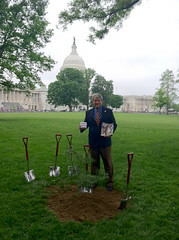 A descendant of the Toomer’s Corner oaks was planted on the grounds of the U.S. Capitol last Friday thanks to the efforts of a Florida congressman who is a 1981 Auburn alum. U.S. Rep. Dennis Ross started the process of getting permission to plant the tree well before the original oaks were poisoned, but the attack gave the idea even more merit, he said. This entry was posted in Community and tagged libraries, toomer's oaks on April 11, 2011 by Wire Eagle. AUBURN – The Auburn University Libraries’ Special Collections and Archives Department has collected for archival preservation items that were placed at the base of the oak trees at Toomer’s Corner following the news that the trees had been poisoned. The collection will be on display in the Ralph Brown Draughon Library beginning Tuesday, April 12, through A-Day weekend, April 16-17, during regular library hours. The library opens at 1 p.m. on Sundays and remains open continuously until 6 p.m. on Fridays. Saturday hours are 9 a.m. to 6 p.m.